75th and Sedgwick: Online Shelter Mag Smackdown? I think plants are perfect for rounding out hard corners. Like where you have the guitar against the TV stand. Throw that guitar up on the wall sista and put a plant in that corner. Would love a plant over by the Eames lounger too. As far as taking care of them, to me it's a crap shoot. If you know what kind of plants they are, just google care instructions and water as often as they tell you to. I also do a little miracle grow a few times a year. It's like going to Smoothie King and getting "The Hulk Chocolate" smoothie. I think a rug for the desk/Eames area is a must. I have to admit, I wasn't lovin' the white curtains at first, but then I realized that this room is actually painted a light grey, it's just so hard to tell from the photo. I think the curtains you chose will look awesome, especially with new blinds! Can't wait to see it all in person this weekend! 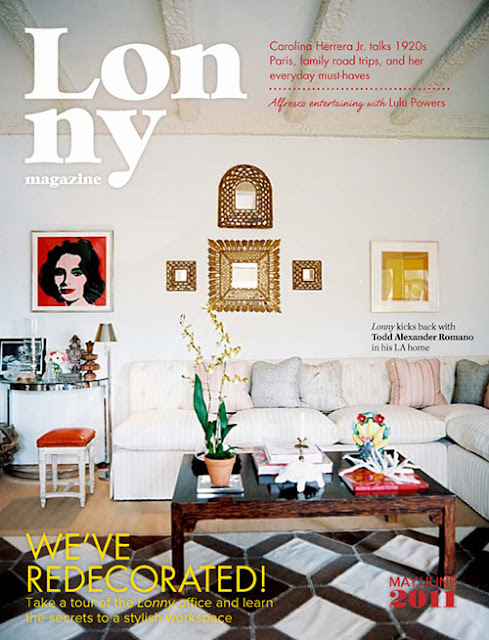 Speaking of decorating, have you been following this online shelter magazine conversation? The New York Times published this piece about them last week. The article documents the recent rise of online mags since Domino folded in 2009. *Pause for moment of silence. * The article caused quite a stir and Design*Sponge followed up with this response. Curbed has a list of top ten jabs from the article. And most of the magazines mentioned in the article followed up with responses on their websites or facebook pages, including a video from Lonny. Obvi we like all of these magazines, because we feature them on the right side of this lil' blog, but the article brings up some interesting points. To me the big con is that I still want to hold and touch the magazine and rip out the pages BUT I do love that you can click on items in each issue and be linked directly to the retailer's website. Genius. AND... I recently came across a new online shelter mag from Australia, Adore Home and it's gorgeous. Love all that color! So, what do you think about all this online shelter mag hubbub? I've been drafting a blog post on this article for a week! Warning - it's going to read very similar to your thoughts! Can't wait to hear your thoughts! I could go on forever about that article!